For those who enjoy a laid-back outdoor lifestyle, our range of beautiful patio and garden awnings can bring you a little bit closer to outdoor living. Bringing the beautiful outdoors closer to your home, an awning keeps you shaded and covered from the elements, but still lets you enjoy fresh air and al-fresco dining whatever the weather. If you love to sit in your garden, having some shade is essential. An awning allows you to enjoy fresh air and a garden view, but gives you the cover you need to stay out of the midday sun. With our unpredictable British weather an awning provides you with a covered outdoor space come rain or shine. With one of our high quality awnings you’ll be able to protect your beautiful patio furniture from the unpredictable weather too. Our range of German engineered awnings give years of service and you’ll be pleasantly surprised at how they change the way you spend quality time at home. With a retractable awning you’ll be able to enjoy full sunshine or shade according to your preference. And not only do our awnings protect you from the sunshine and rain, they offer some privacy from overlooking neighbours as well. We have a fantastic range of options including manual, electric or fully automated systems to cover the largest of patios and decked areas. We also have a variety of lights and heaters giving you the option to entertain late into the evening. What’s more, all of our products are backed by our comprehensive 5 year warranty. We have three decades of experience in supplying and fitting awnings to our customers across Surrey and throughout the South East. If you’d like to enjoy a panoramic view of your garden in a beautiful shaded spot, why not speak to one of our experienced staff? We’ll help you make the right choices for the best awning to suit your home, your budget and your lifestyle. Our patio and garden awnings provide elegant sun and shower protection so you can enjoy al-fresco entertaining all year round. Markilux is one of the largest German brand names in awnings and we’ve been installing their products for 30 years. We choose to champion Markilux products because they offer fantastic and innovative designs and high quality materials. They are the only German manufacturer to produce both the metalwork and the fabrics under one roof. The quality of the product is why we are confident in offering a full 5 year warrantee. We know these awnings are built to last. We’ll happily fit any brand of awning at your home, but we couldn’t recommend the Markilux awnings more highly. 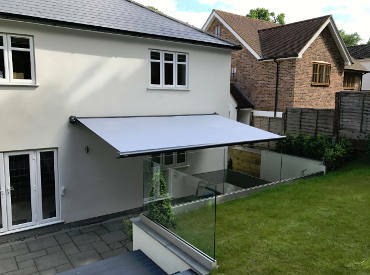 Markilux high-quality awnings are weather resistant, robust and extremely versatile. They include intelligent features and offer heat protection, a sunscreen and weather protection to make outdoor living a dream come true. We stock a huge range of Markilux awnings, blinds and accessories. Click here to take a look at all of the Markilux products that we offer. Timeless in appearance and built to last, we know you’ll fall in love with your awning as soon as you set eyes on it. For more information on Markliux blinds including Markilux awnings pricing, please click on the options below. Let us inspire you to get the best out of your home. For more information on Markliux blinds including Markilux Awnings Pricing, please click on the options below. Skylights bring a flood of light into our homes, creating a bright ambiance but also require a level of control. 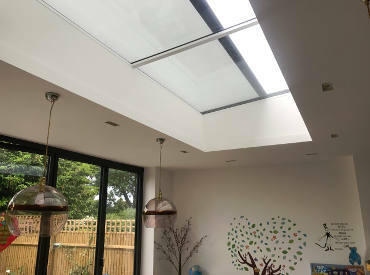 Our client in Dulwich village contacted us with a cry for help with their new skylight. 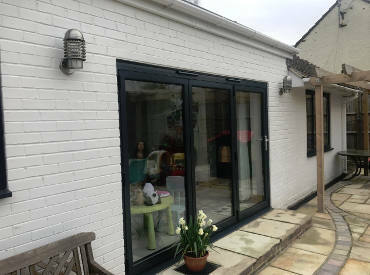 From an active family home in Mannings Heath, Horsham, we were invited to provide solutions for a new set of Bi-fold doors that were recently installed as part of a home improvement project. We were asked to create a comfortable and relaxing entertaining area for our clients in Chislehurst, Kent, so they could entertain friends, family and guests in a beautiful space.